"I am not that perfect, but I hope you will learn to accept me." Pioneer brings the first five installments of their latest romantic comedy in Ai Yori Aoshi, based on Kou Fumiziko's manga, with character designs by Kazunori Iwakura (Rune Soldier). Originally airing in 2002, the 24-episode series will be released on a total of five discs. For the past eighteen years, Aoi Sakuraba has been preparing herself for an arranged marriage to a boy she knew in her childhood. Her arrival in Tokyo finds her out of place, clothed in her traditional kimono and sandals, lost in the overwhelming atmosphere of the big city. When she sends herself tumbling as her sandal strap breaks, a kind boy catches her fall, and makes the necessary repairs. Kaoru Hanabishi, a Meiritsu University student, is on his way home, and offers to show Aoi to the station platform where the train they both need to take will be stopping. Aoi tells Kaoru that she is here to find her fianc�, to find out why her long engagement has been called off. After volunteering to guide the girl to the address she has for him, only to discover it is a vacant lot, Kaoru invites the girl back to his apartment, after her obvious upset. She then shows him a photograph from her childhood of the boy she is looking for, one which Kaoru recognizes as his own. At first, Kaoru believes Aoi has been sent by his family to try to get him to return to the clan he has disowned, but he soon learns that not even her parents know what she is up to. That changes when her guardian, Miyabi Kagurazaki, shows up, ordering the girl back home. As Kaoru begins to examine his feelings for Aoi, the bond between them grows, which sets the pair off on a possible future together, but the prestige of the Sakuraba name is not about to be defaced with the scandal of its heir living with a man in Tokyo, especially one who has forsaken his family. 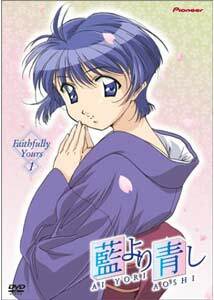 For the first four episodes, Ai Yori Aoshi sets itself up as a nice, slow-paced romantic comedy, but the fifth episode makes an abrupt departure from the tone of the show, as a plethora of new characters enter the scene, and a common harem situation becomes apparent. It's a bit soon to tell whether this is a permanent direction or not, but comparisons to Tenchi or Love Hina are not without merit in this regard. Still, from what has been presented so far, Ai Yori Aoshi looks to be a keeper, with nice artwork, good acting, and, at least in the beginning, a subdued pace with comic overtones. There is a fair amount of fanservice present to satisfy those looking for it, along with the typical relationship and situational embarrassments. While I'm sure love will conquer all in the end, the road it takes is most of the fun. Image Transfer Review: As a very recent show, the presentation is gorgeous as expected. Colors look great, whether fully saturated or more understated, with solid black levels. Aliasing is practically nonexistent, and there is no rainbowing, print defects or other problems. Audio Transfer Review: Stereo audio is available in both original Japanese or the Bang Zoom! English dub. Not overly flashy, the soundstage is nicely utilised, and the sound design blends the atmosphere of the locations with easily discernable dialogue and well-balanced music tracks. There are no technical issues to speak of. Extras Review: A nice addition is a live action Yoko Ishida music video (1m:44s) for Towa no Hana (Eternal Flower), the opening credit theme. The US trailer, and a 29-image line art gallery featuring the two principle characters are also included. Pioneer's limited edition goody for this series is a postcard in each release. I would note that menu navigation was fairly sluggish on my principle player.The Pioneer trailer reel contains X TV, I My Me Strawberry Eggs Gatekeepers 21, Vandread: Second Stage Fushigi Yugi: Eikoden, Chobits, Sugar, Mahoromatic and Lupin the 3rd. Housed in a clear plastic case with a reversable cover, this first disc is available as a standalone or with a sturdy cardboard box which holds the entire series. The insert folds open to a mini poster, and has some liner notes explaining the name suffixes used. Ai Yori Aoshi delivers everything one would expect from a romantic comedy anime. The characters are awkward and shy, often finding themselves in precarious and embarrassing situations. The ensemble cast picks up in the final episode, adding more challenges to the fate of the central couple. I enjoyed the languid feel of the first arc, but it's too soon to tell whether the harem formula will figure as a huge part of the story. Thumbs up so far.